Dr. Çak graduated from American Colligate Institute in 1997 and Hacettepe University Faculty of Medicine in 2003. She completed her specialty education of Child and Adolescent Psychiatry at Hacettepe University Faculty of Medicine in 2004. She completed her mandatory service in Mardin between 2009-2011. 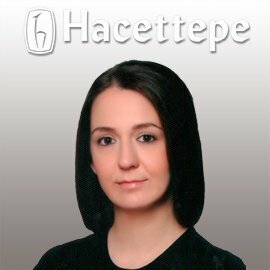 She started working at the Department of Child and Adolescent Psychiatry of Hacettepe University Faculty of Medicine as a lecturer, in 2012. She attended “Psychodramatic and Sociometric Techniques in Group Therapies” training program, organized by the Turkish Group Psychotherapy Association of the Dr. Abdulkadir Ozbek Psychodrama Institute, between 2004-2009. She recevied the Turkish Association of Child and Adolescent Psychiatry Project Award with her thesis project “ADHD and Attachment in Preterm Preschoolers” in 2008 and Prof. Dr. Atalay Yörükoğlu Young Scientist Award in 2013. In 2006 she has attended “6th European Research Seminar in Child and Adolescent Psychiatry” granted by ESCAP in Italy, and “ECNP School of Child and Adolescent Neuropsychopharmacology” granted by ECNP in 2012.